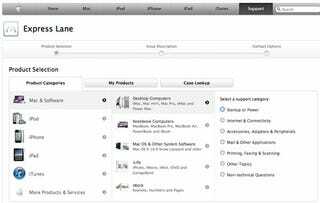 Available for Apple customers still within their warranties, Express Lane is a fancy tech support service for cutting down forum-trawling to find help faster. It also stores details on previous issues you've had with their products. It's a nice gesture from Apple, and with any luck will help sidestep the need to book in an appointment at the Genius Bar to get something fixed. Detailing the issue at hand before making the trek into town to a shop could save valuable time if it's a relatively easy fix.